Posted May 23rd, 2008 by Ms. Jen & filed under nature + environment, photos + text from the road. Posted May 23rd, 2008 by Ms. Jen & filed under nature + environment. Fri 05.23.08 – Othewise entitled “Winter Storm in Late May”. The light streaming into my apartment this morning with the cold wind that was making my curtains billow was not the bright light and warm winds of May or even the dull, clouded light of early June gloom, but instead this morning was the completely out of season winter storm continued its assault on the whole of the West Coast (from BC to Baja), as well as the Western States. 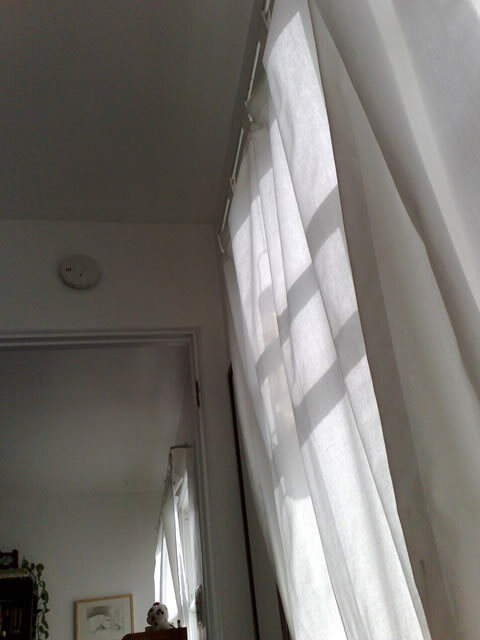 The light this morning was intense with a bright gray light streaming in and the curtains puffed out with chilly wind. Now it is Friday evening and I can’t walk the dogs for the rain. If you live in a wet place, this is not strange. But SoCal is on the edge of the desert. We are a “Mediterranean Climate” in the best of years or a “Semi-Arid” climate in the worst of years. In the best of years the rainy season starts in late Oct. or early Nov. and lasts until March or April, in the worst of years we are lucky to get rain in Feb. & March. Coastal SoCal (within 100 miles of the Pacific Ocean) does not receive the “North American Monsoon” rains in the late summer that Arizona and New Mexico receive. To get rain, real rain, not sprinkles from the inversion layer clouds, anytime from May all the way to Oct. is a very rare event and considered strange. The last two days with near gale force winds, rain, and chilly weather in late May have been strange. This is weather we expect Dec – Feb, not months later. Odd, but welcomed. When you live on the edge of a big desert, any rain is welcome. Posted May 22nd, 2008 by Ms. Jen & filed under news + events. The above title sounds odd, but it is true. I am one of those people who exfoliates and moistures every day. Instead of having dry, flaky elbows & knees, mine are very soft and supple. Maybe too soft, if that is possible. Three weeks ago, I went to dinner with a friend and we were sat at a wooden table with heavy varnish. About half way through dinner, in between courses, I noticed that my left elbow slid about 2 inches across the table and was very painful. I looked down and saw a 3/8 inch diameter, many layered skin patch sitting on the table top. Fast forward to having tea with Abhi this last Sunday at Apostrophe’s in Notting Hill, tea and coffee has been consumed, we are sitting and chatting. The table top is either lacquered wood or plastic (sorry, I can’t remember), my elbows are resting on the table top and, again, my elbow slips and skin scrapes off my right elbow. Here I type tonight with both elbows scrapped and scabbed up. Why? Yes, if one falls on concrete or asphalt or gravel, one expects to get a good scrape, but not off a table in a restaurant or coffee place. Have you every heard of such a thing? I googled it to find out if this is a skin condition, but only got results for dry, flaky elbow skin, not soft elbow skin that is coming off with very little provocation. Posted May 22nd, 2008 by Ms. Jen & filed under fun stuff, nature + environment. 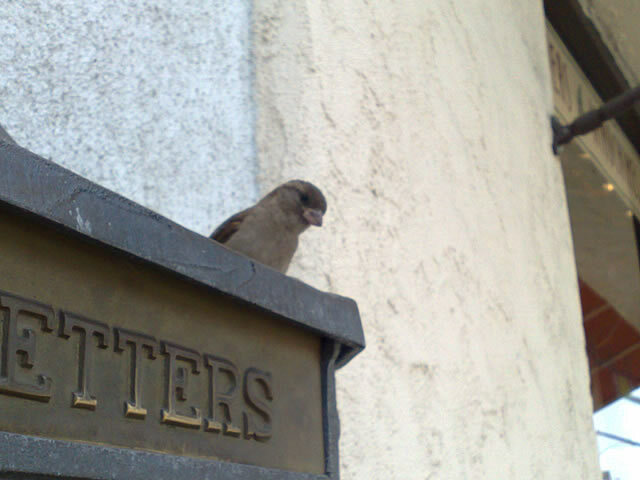 Thurs 05.22.08 – Local house sparrow gets nosy and watches Scruffy intently. 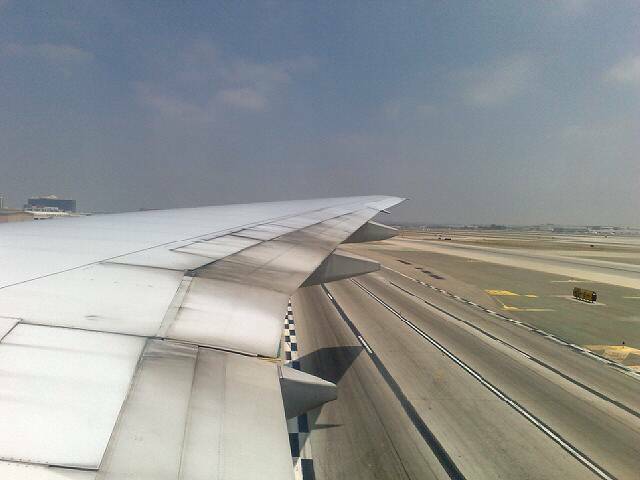 Posted May 21st, 2008 by Ms. Jen & filed under oh, california, photos + text from the road. 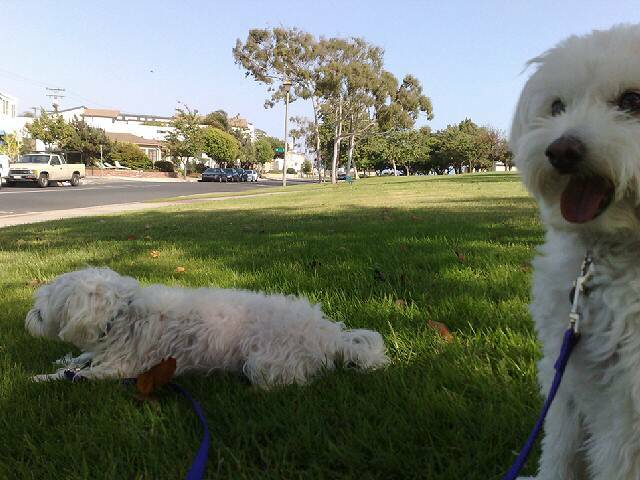 Wed 05.21.08 – Hanging out on the Greenbelt with Scruffy and Belle after walking down to the Library to return a book. 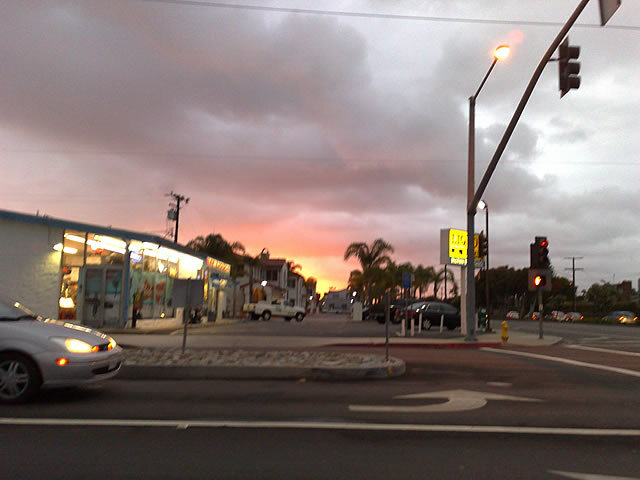 Posted May 20th, 2008 by Ms. Jen & filed under oh, california, photos + text from the road. Posted May 20th, 2008 by Ms. Jen & filed under photos + text from the road. 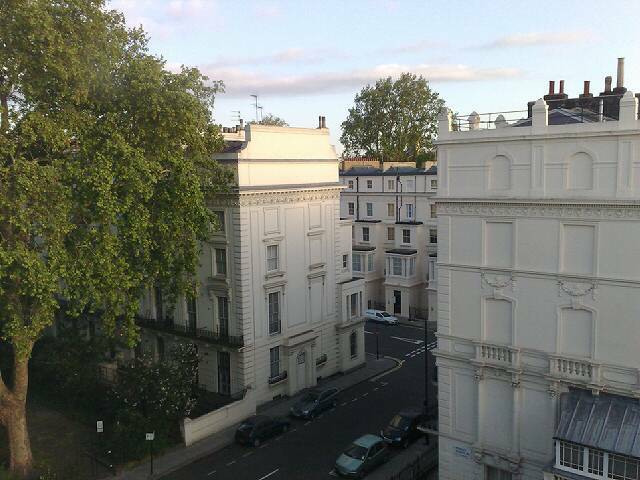 Tues 05.20.08 – Photo taken by Ms. Jen out the window of her 4th floor hotel room in Bayswater, London, with her Nokia N95 way too early in the morning before departing to the airport. Posted May 19th, 2008 by Ms. Jen & filed under photos + text from the road. Mon. 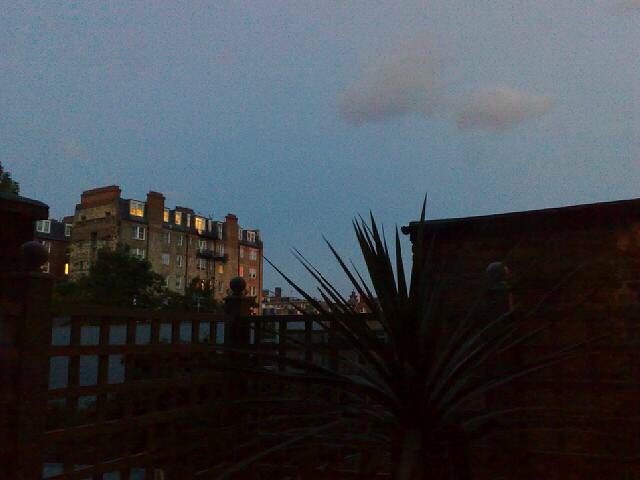 05.19.08 – Last evening in London before departure back home.